Shiny Alolan Graveler in game: 15 Who? Important notice! 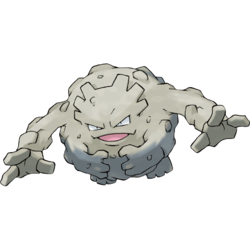 Pokemon Shiny Alolan Graveler is a fictional character of humans. Graveler is a living, bipedal boulder. It has a rocky crest about its small eyes. It has four arms, each with a three-fingered hand. It was shown in Pokémon Snap that, despite having legs, it can revert to a legless form. This grants it the ability to float. Its preferred locomotion is rolling, specifically because it is a slow walker. It often rolls down mountain paths at high speeds, crushing objects in the way and stopping by running into huge rocks. If it breaks or shatters, it has the ability to restore itself overtime. Graveler climbs a mountain from base to summit, feasting on rocks all the while. Upon reaching the peak, Graveler rolls down to the bottom. Graveler can be often found on mountain trails. The Alolan Graveler looks similar to their regular counterpart, with the addition of dravite crystals on parts of its body, and iron sand attracted by magnetism. This iron sand is concentrated above its eyes, giving the appearance of a uni-brow. There are also iron sand hairs on its outer arms and the sides of its face. The Alolan Graveler lacks defined digits on its upper limbs and has two toes on each foot rather then three. Graveler first appeared in The School of Hard Knocks. Giselle used it against Misty's Starmie to prove that Misty's victory despite a type advantage against her favor was not a fluke. In Spring Fever, Rory had a Graveler that he used to dig for hot springs. 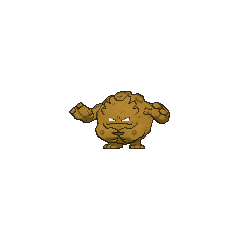 In Hooked on Onix, Graveler, its pre-evolution, and evolution were the loyal subjects of King Onix. Multiple Graveler appeared in Bucking the Treasure Trend! where they attacked Ash and his friends. Two Graveler also appeared in Genesect and the Legend Awakened battling the Genesect Army at Pokémon Hills. A Graveler appeared in Princess vs. Princess competing in the Queen of the Princess Festival contest. 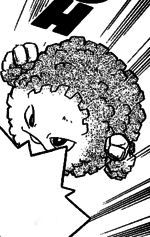 A Graveler made an appearance in The Ultimate Test as one of the Pokémon used in a Pokémon League entrance exam. A fantasized Graveler made an appearance in Type Casting. Pietra has a Graveler which she used it for her digging project in Right on, Rhydon!. A Graveler also appeared in Celebi: Voice of the Forest, Pokémon Heroes: Latios & Latias, Lucario and the Mystery of Mew, Giratina and the Sky Warrior, Camping It Up! and Arceus and the Jewel of Life. A group of Graveler appeared in A Maze-ing Race! A Graveler appeared in Chimchar's nightmare in Tears for Fears!. A Graveler was amongst the group of Pokémon used to attack Dawn, Brock, Officer Jenny, and Solana in Pokémon Ranger and the Kidnapped Riolu! Part Two. 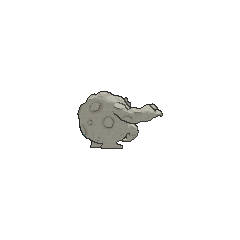 Graveler and several Geodude appeared in Steeling Peace of Mind!. Graveler debuts in Onix is On! of the Red, Green & Blue chapter as a Pewter Gym Trainer's main Pokémon. It is quickly defeated by Red and Poli with a Water Gun and Ice Beam combo. Another one is seen next to Brock, suggesting that he is its owner. 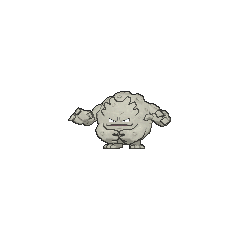 Later in Tauros the Tyrant a Team Rocket Grunt used a Graveler in an attempt to catch Green. In A Tale of Ninetales a wild Graveler attacks two of Blue's fan girls. 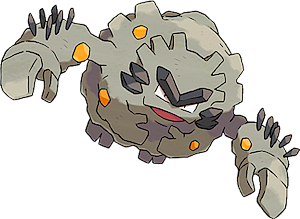 Brock gives Yellow a Graveler in As Gastly as Before which she names Gravvy and which eventually evolves into Golem in The Might of... Metapod?!. In Can You Diglett? a Graveler appears as a silhouette when Agatha and Lorelei explain to Red that Pokémon and people cannot coexist with each other. In The Last Battle XIII a Graveler was one of the Pokémon sent to help during the fight in Ilex Forest. Roxanne has a Graveler which she has take her to the Gym Leaders' meeting in Hoenn. B-2 has a Graveler which was used at the dock of Iron Island. Occasionally turns one non-Support Pokémon into a rock. Graveler appears to be based on a boulder. Its four arms may be based on Hindu fake such as Shiva or Vishnu.